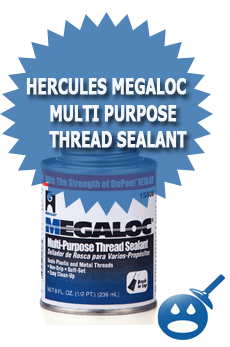 Hercules has a great product called “block seal” for Threads and Gaskets. This is an all-purpose sealant that can be used for valves, gaskets, flanges and joints. 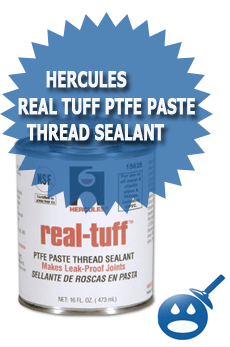 Hercules Block Seal is a superior gasket sealant that can be used in the plumbing industry as well as other industrial applications. It is best used for water, oil, gasoline, tanks and pump repair. This product can be used on materials such as Black Iron, Brass, Copper, Stainless Steel, Galvanized Steel, PVC and CPVC. Block will set up fast as dry just as quickly. This product offers a leak proof resistance when used while under high pressure. The best applications for the Block Seal are Threads and Gaskets used in plumbing, heating, piping, automotive and other industrial jobs. Block seal works in conjunction with Compressed Air, Butane Gas, Gasoline, Jet Fuel, Hydraulic Oils, Mineral Oils and Natural Gas. Hercules recommends that this product not be used on any Natural or Synthetic Rubber. It should not be used on lines that are carrying any strong or concentrated acids. Hercules recommends that you read all of the necessary warnings and MSDS sheets before applying their product. 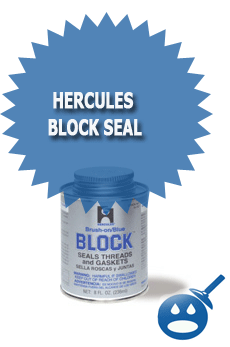 Hercules Block Seal has a Pressure Rating for Liquids of 12,000 Psi and a Gas rating of 2,600 Psi. The temperature performance of this sealant is minus 90 degrees Fahrenheit up to 450 degrees Fahrenheit plus. If the material is steel pipe, Block can hold up under a temperature range of minus 50 degrees Fahrenheit to 450 degrees. The boiling point of this product is 180 degrees Fahrenheit and a vapor pressure of 20 degrees Celsius. Block Seal by Hercules Chemical Company can work under expansion, compression, extreme vibration as well as high temperatures. If you are using Hercules Block Seal on threaded joints, it is recommended that you clear away any oil or any debris from the joint. Using the brush included, apply the Block to any male thread and brushing into the root of the threads. If the application is for Flanges and Gaskets, you will want to use a liberal coat on the mating side of the flange or gasket. The product should set for about 5 minutes. Test the sealant and start your assembly. This product comes in 4 different sizes, a quarter pint to one quart. All containers come with a brush in cap for easy application. Keep the container closed tightly to avoid hardening or over drying. Avoid contact with the skin and eyes. If Block remains on the skin for a long period of time, it may cause your skin to crack or become dry. If Hercules Block Seal gets on the skin, you can use Isopropyl Alcohol to remove it. Keep this product out of reach of children and pets. In case of ingestion, dilute with water or milk and contact a doctor right away. You can find this product and other Hercules Products at Ace Hardware, Home Depot, Lowe’s or your local plumbing or hardware supply store. i war not user to comment you this article.. but i want to say that.. we want see your new articles on this blog.. see you.. Article is very well written and very informative. I will bookmark site for future visits and Refer site to other end users. I really appreciate this well written article. The article is well knowledgeable very informative. I will bookmark site to refer to other end users and for future visits. Now enjoy your busy moments with our Musial Channel. It’s a musical site to entertain you with latest music. You just need to click ones and can listen your favorite music. Another facility is available on our site, the facility is chat with your friends.